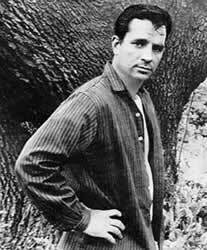 One of America's most famous travelers, Jack Kerouac, would have turned 80 this coming Tuesday, March 12. "On The Road" is a classic for the ages, especially resonant for anyone looking for free-wheeling adventure by day and reflective poetry readings by night. Our free-wheeling poet/reporter, Hank Rosenfeld, had a Kerouac-like experience himself, post-college. And we're not at all surprised. SFX: Jack Kerouac from "October In The Railroad Earth": "San Francisco San Francisco yer a muttering old bum in a brown beat suit, trying to make a woman on a rainy corner." I was looking for the Beats, looking for the ghost of Jack Kerouac. Yeah I was 30 to 40 years too late, I know, but there were still a lot of old hippie-beatnik types around, old Berkeley-ized free-speechers, flower-power grandparents... I did what any self-respecting artist did -- I got a job driving a taxicab. Driving a cab in San Francisco is one of the best jobs in the world because almost everyone who gets in is a tourist in a good mood because they're in one of the greatest cities in the world. I started setting up my own touring service, doing flat-rate excursions through Golden Gate Park after dark, sneaking people from France into the Arboretum under full moons, or taking them down to the end of the Great Highway to watch the moon drop into the ocean, or up the Marin County coast smelling the wet eucalyptus, seeing Redwoods in a fog. Special trips, like driving families with young children up the famous Lombard Street, "crookedist street in the world" -- up, instead of down, or taking them to feed the buffalo in the park, how they liked sourdough best stuck through the fence holes into their big gray tongues. San Francisco is a giant amusement park for visitors, really. When I first started giving off-the-meter tours, I would do things, like have some folks from Japan -- one night tell me they wanted to get to "314 GROVE" Street, which is practically way out in the avenues. So we drove around and around and I couldn't find "314 GROVE" until I finally figured out they wanted "Fisherman's Wharf,"" -- ohhhh... Fisherman's WHARRfffff..."
One night, a man in my cab made me take him to his house in Sausalito, where he cooked dinner for me, and we played billiards and ping pong. He kept telling me not to worry because "I'm a great guy! Everybody knows me!" But I could tell he was just really lonely, so I stayed and took the $10 tip. First time I ever saw a real beatnik? Cape Cod, 1960's out in Provincetown. He was walking around in bare feet with a banana in his back pocket. I remember that banana standing out as something different, and my Dad worrying about the whole barefoot thing because he owned a shoe store back in Detroit. I always feared I'd end up a San Francisco muttering old bum, the kind of guy the tourists cower from -- the kind of guy that makes the city not quite so beautiful. One night, Gregory Corso fell into my cab. Gregory Corso! "Can you take me to 19th and Guerrero?" Grey sweater, granny glasses flung down, drunk and disheveled. Gregory Corso, angel-headed beatnik hipster guy -- par excellence -- who wrote the epigraph to Ginsberg's seminal "Kaddish: Be A Star Screwer!" That was it -- the whole thing. So Corso was in my cab, and as I let him out, I gave him his change and said, "Um, I just wanna tell you that my friends all admire you and we wanna be like you." "And your friends, yeah, we all try and be beat, you know -- it's all hopeless, so there's nothing left to do but hope?" "I used to have some beat friends," he said. He put his grandma glasses back on his head and walked away down Guerrero. That was too much for me. The next day I quit driving a cab. A month later I left the Bay for greener pastures.